Join the Dutch opera of 'Anne&Zef', translated into English for this special occasion. The opera tells the story of Anne Frank who meets the 15-year-old Albanian boy Zef Bunga in heaven. When Zef talks about the Kanun, the blood feud and his brother, Anne talks about her time in camp Westerbork and the concentration camp Auschwitz. They complain about their parents and share their dreams. This becomes the basis for a very special connection between the two teenagers. 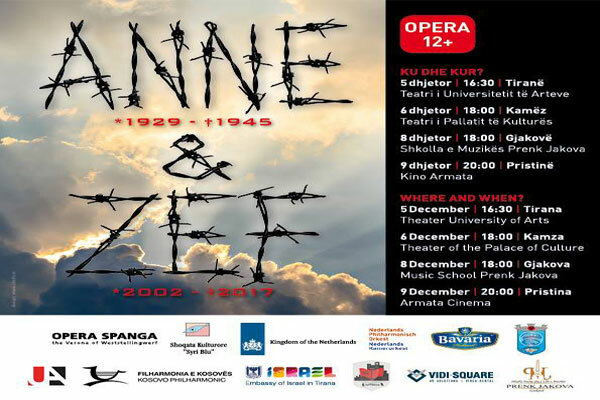 The entrance for the opera is free but we would like you to confirm your attendance via tir@minbuza.nl for Tirana and Kamza and via pri@minbuza.nl for Gjakova and Pristina.